I almost cried when I woke up Saturday morning and read an email from Picnik.com saying that they were closing up shop as of April 2012. What?!? I know I speak for all Bloggers and Photo enthusiasts everywhere when I say I am beyond shocked and disappointed by their news!! Why??? Don't they know I am about to have a baby and do not have the time to learn a new photo editing tool??? Everyone LOVED Picnik!!! It was so unique and better than any on-line photo editing website out there. I have used Picnik to design my blog, edit photos, and create all of the beautiful collages that you have seen in my posts. Most of my 'Tips to A Better Blog' posts were all Picnik.com tutorials. 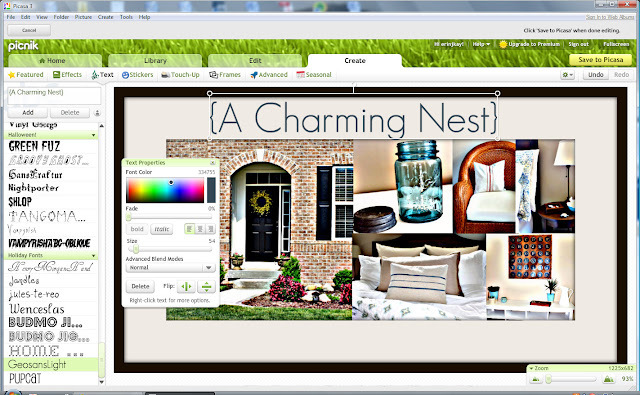 I loved sharing how to make blog buttons and blog headers with such a user friendly tool such as Picnik.com. I do not own Photoshop Elements or have the time to learn this tool and Picnik.com certainly got the job done in my opinion. I was actually happy paying the $4.95 a month just to enjoy all of the premium benefits that Picnik.com had to offer. I may actually be willing to pay more just to keep the website going. It was just that good!!! So I am sure I speak for most of you that we are all now scrambling to find a photo editing website to master before April 2012. I am sure you can also agree that who has the time to find a new tool just as user-friendly as Picnik and to become an expert at it like we all were with Picnik. In the devastating email from Picnik.com, they explain that we can start using the Google+ photo editor instead. As of now, I do not have a Google+ account or really wanted to join yet ANOTHER social media website but it is looking like I may now have to just to see what their editing tool is all about. Fortunately, I have found a few tutorials around the Blog world with the same desperate plea as myself and have even demonstrated a few tutorials of different tools around the Internet. I haven't had a chance to try any of them yet, however, I am certainly willing to try!!! Today Censational Girl demonstrated Pixlr which has a few photo editing features that she found attractive along with iPiccy, GIMP and Splash Up. I have yet to try either of these tools but I am willing to learn. She does however mention that not one tool alone can even compare to Picnik. Between Naps on the Porch also put together a list of 9 free alternatives of photo editing websites that I am plan on checking out as well. Fotoflexer looks especially interesting to me. I saw on Twitter yesterday that Natalie over at Extraordinary Love had put together a Google+ tutorial which shows how to edit photos. Unfortunately she mentions that she could not find a college feature, hopefully one will be added in the future when Picnik.com shuts down. If you are looking for a Photo editing tool that uses collage similar to Picnik.com, I found a Blog Header tutorial from over at A Charming Nest that demonstrate how to create a blog header using the collage tool in Picasa. Since I designed my blog header from the Picnik.com collage feature, this was especially interesting to me. If you know of a photo editing website similar to Picnik.com or how you are handling this big news, I would to hear from you!!! I like Picasa as well. It's not quite as good as Picnik seemed to be (or maybe I'm just not used to it yet) but it is very easy to use with similar edits. I too am super duper sad about picnik, but I do all my collages in picasa. I love picasa. It store all my pics on picasa.com and downloaded their photo editing software to my computer. I hope to find something else similar to picnik though. I will miss it! Great job. It is very disappointing. But, you've helped me it a little easier. Picasa has been owned by Google for a couple years now. It's a free download, and makes it easy to store and retrieve photos. It currently interacts with Picnik on the desktop version, but in toying around with this same dilemma yesterday, I've learned I can load pics to Picasa, and then go to Google+ and edit them with their editing tool and then resave into Picasa without posting them to my Google+ wall. I think this is the best solution, until Picnik is closed. 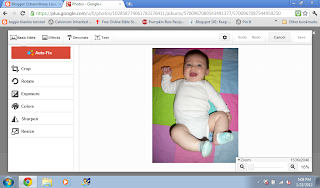 I'd bet that a link to Google+ edits will be added to Picasa in late 2Q 2012. I am beyond sad and even did a blog post about this too! :o( I love the collage feature and it is so easy to use. However, mostly I am enjoying the premium features that I didn't pay for before so maybe that has something to do with it. I'll have to check out for sure those other online options- thanks for putting this together!! Seems like lots of changes are coming. I have been reading that google friend connect is going away- how do you plan to keep up with your followers? I am not sure what I am going to do and so I am curious what others are doing! Congratulations on the new (soon-to-be?) baby. I completely understand your trepidation with the closing of Picnik. My name is Jenn, I'm part of a team of former-Picnikers. We see that you've been an avid user of Picnik and love to hear about your passion for great photos! As you are looking for a Picnik replacement that'll knock your socks off, I wanted to let you know about www.PicMonkey.com -- currently being built by a couple of the folks who brought you Picnik! It’ll be familiar, fun, and totally user-friendly. Sign up PicMonkey's site and we’ll keep you updated on a launch date. Also, feel free to send me your feedback, feature requests, and, of course, any questions you have!